International Journal of Research in Health Sciences,2014,2,1,20-25. MD Microbiology, Assistant Lecturer, Dr. D.Y.Patil Medical College, Kolhapur. Diabetic foot ulceration & infection is the most common cause of diabetes related admission to hospital & remains one of the major reason for lower limb amputation .Mostly diabetic foot infections are mixed bacterial infections .For proper management of infections in these patients appropriate antibiotic therapy should be started at the earliest based on culture & antimicrobial susceptibility testing. Infection with multidrug resistant organisms is common in diabetic foot infections .So the study was conducted in the Dept. of Microbiology, Dr. D.Y.Patil Medical College, Hospital & Research Institute, Kadamwadi, Kolhapur to find out prevalence of Methicillin Resistant Staphylococci in Diabetic Foot Infections during period December 2009 to August 2011. Total 115 samples from foot ulcer in these patients were studied .Total no. of isolates found were 131. Out of these 56 isolates were of staphylococci (42.75%). 39 isolates out of these Staphylococci were Staphylococcus aureus and 17 isolates were of Coagulase negative Staphylococci (CoNS). Antibiotic susceptibility testing of these isolates was done by Kirby – Baeur Disk Diffusion method for the antibiotics routinely tested. Results were recorded as per CLSI guidelines. Methicillin resistance was detected by Oxacillin Disk Diffusion & Cefoxitin Disk Diffusion test. Methicillin resistance was found in 30 isolates of Staphylococcus aureus (MRSA76.9%) & 6 isolates of CoNS (MR-CoNS 35.29%). Total methicillin resistance in Staphylococci was seen in 36 isolates (64.28%). 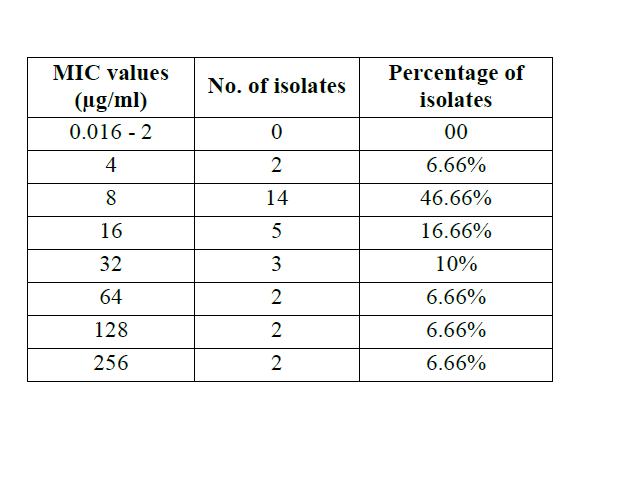 Minimum Inhibitory Concentration (MIC) for Oxacillin of these resistant isolates was detected by Hi-Comb MIC test. MIC of all these isolates was above 4μg /ml. All these Methicilli resistant strains of Staphylococci were sensitive to Linezolid & Teicoplanin.